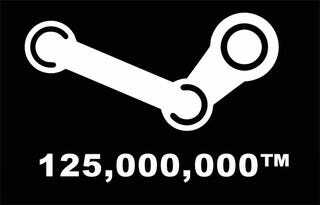 Valve announced today that there are now over 125 million active Steam accounts. It's a marketing brag, yeah, but it's also a figure worth looking at. The PC market was, for a very long time, a shadowy, nebulous thing. It was almost impossible to track down just how many people were playing games on the system, where they were playing and what they were like. Now that Steam is as close to a universal platform as we're ever going to get on PC, though (come on, who hasn't got at least one game they have to use Steam for), we can get very, very close, especially since Steam likes to track your purchases and demographics so keenly. And that number — 125 million active accounts — is enormous, even when you take into consideration that some of them are second or duplicate accounts. In case you're having trouble conceptualising a figure that big, here, let me help you. There are an estimated 126 million people in Japan. 121 million in Mexico. Germany "only" has 80 million, the United Kingdom struggles along with 65 million, and Australia somehow functions with just 23 million citizens. Imagine if every single person in Japan, from the tiniest baby to the oldest of old folk, was a Steam account. If real-world comparisons aren't doing it for you, how about this: only two video game consoles in history have sold more than 125 million units, those being the PS2 and Nintendo DS. So the next time you wonder why so many games these days go straight to PC, not even bothering with consoles or handhelds, here's a big reason why. Sure, it's easier to launch a game on PC, but there's also the fact you're selling to one of the biggest gaming markets on the planet.